Saturday, November 24 2018, 2 to 5 p.m., enjoy our fifth annual Shop Small Sip and Stroll. With multiple stops, you’ll sample boutique wines, craft beer and cider throughout the district. Tickets for this sip and stroll are always the best price of the season at an advance ticket price of just $15 per person or upgrade to $20 and get a souvenir wine glass with our cute little bird logo on it to take home. Check in the day of the event will be inside The Lovely Boutique Market, 2906 Corrine Dr. Orlando 32803. Tickets on sale now. New this year, we’ll also have live music al fresco throughout the district, 2 to 5 p.m.
And if you do any shopping this day, shoppers will receive a Small Business Saturday re-useable canvas bag with purchase at any of the participating small businesses (list coming out soon), while supplies last. Five of the bags given away on Small Business Saturday will include a golden ticket, each one redeemable for a pair of passes to our Retro Modern Home Tour and After Party, which returns April 6, 2019. Don’t miss this great holiday kick off! *Winner will be contacted through Instagram. Winner will have seven days to pick up their prize, after which it is forfeited and we will draw another winner, who will be contacted via Instagram and have seven days, etc. You get the idea. Zombietoberfest and The Night Market at Audubon are Saturday, October 6, 2018, 5 – 10 p.m. in the Audubon Park Garden District, conveniently located near Winter Park and Baldwin Park, at the intersection of Corrine Drive and Winter Park Road in Orlando, Florida. Come out and enjoy over 60 vendors, food trucks, two craft beer gardens, live music and a DJ, The Nightmare Before Christmas on the big screen and more! APGD’s biggest event of the year includes the Night Market at Audubon in the West Corrine plaza, Kidstoberfest (6 – 8 p.m.), free costume contest at 6:30, free showing of The Nightmare Before Christmas at 7:30-ish, live music at Bikes, Beans and Bordeaux, two craft beer gardens 5 to 10 p.m. (outside Redlight Redlight and Bikes Beans and Bordeaux Cafe), DJ 5 – 10 p.m. in the West Corrine plaza, food trucks, late night shopping, and food and drink specials throughout the district. Come party with us under the stars in the Audubon Park Garden District. Orlando’s best-kept summer secret returns with Audubon Park Garden District’s 10th Annual Bastille Day Bash on Saturday, July 14, 2018, featuring an all-new Moulin Rouge cabaret; free baguette fencing; a free makers market – the French Market at Audubon; live music; a special guest appearance by Marie Antoinette, French wines and champagnes; French beer on tap; and a ticketed event – the 7th Annual French Cheese and Wine Pairing. Orlando’s original local food stroll returns Saturday March, 3, 2018, 2 to 5 p.m. This self guided tour features locally sourced produce, handmade foods from locally sourced ingredients, and sustainably produced Florida cheese and meats, in addition to Florida craft beer, boutique wine and more. Learn more. 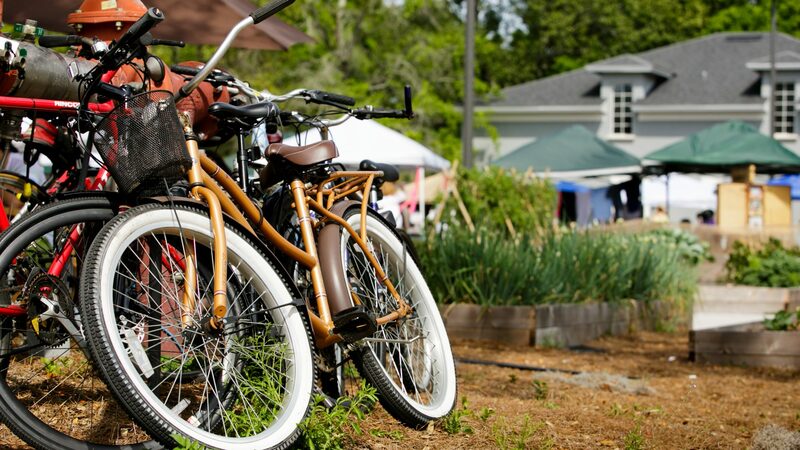 Saturday, April 7, noon to 5 p.m., check out the Spring Market at Audubon. This market will feature only the best in handcrafted local and regional gifts; plants; art; food trucks; baked goods; vintage items; and music; along with free workshops on sustainability. This free event will take place under stately oak trees, on the beautiful grassy grounds of the Audubon Park Covenant Church (3219 Chelsea St. Orlando). Read more. Saturday April 7, 2018 the Audubon Park Garden District invites you to visit some of the most beautiful and unique gardens right in our own backyard during our inaugural APGD Garden Tour. You’ll enjoy discovering lush, inviting spaces, while gathering ideas to make your yard a beautiful and healthy garden. Read more. Enjoy vintage shops, boutiques featuring local products, music, books, jewelry, gifts and much more. The Audubon Park Garden District offers some of the best restaurants, craft beer, craft cocktails and desserts in Florida. Professional services in APGD include florists, caterers, auto repair, legal help, landscape designers, healthcare providers and more.